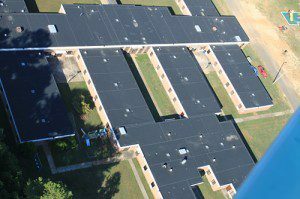 We offer roofing services for both commercial and residential properties in the Fort Mill area. Different styles of roofing are more popular in various areas of the country, but the most commonly used material is shingles. One of the reasons that so many homeowners opt for shingle roofing is because the material is cost-effective and very durable, so it won’t break the bank to have the shingles installed and you won’t have to replace them in just a few years. Shingles also look good on all types of homes, from modern abodes to traditional bungalows. You have plenty of options when it comes to shingles, so it’s easy to find a style that complements your house. Shingles also protect the interior of your home from cold and hot air, as well as rain and snow as the seasons change. Here in the Fort Mill, South Carolina area, our team at Midian Roofing offers roofing services for both commercial and residential properties. If you are looking for residential roofing, we offer metal roofing and metal shingles, R-panels, real slate, single-ply, composite materials, and much more. For commercial clients, we provide TPO, PVC, built-up, mod-bit, single-ply, three-ply and four-ply, Duro-Last, and other options. With so many available materials to choose from, you can easily find the roof that you will love. Our roofing team is one of the best in the business, and our A+ rating with the local Better Business Bureau reflects that. We are also proud members of the local Chambers of Commerce, and we are fully licensed, bonded, and insured to provide service in Fort Mill.